As countries began to ratify the 2006 UN Convention on the Rights of People with Disabilities (CRPD), there was a clear need for resources that would help with the implementation of the Convention, especially in places where accessibility had not been previously integrated into mainstream practices. This report provides a structural and language template for countries (and regions, cities, other organizations) to adopt accessibility policies. In six separate modules, this publication covers the broad spectrum of Information and Communication Technology (ICT) accessibility. In the sixth module, public procurement policy is covered. The policy language can be adopted in whole or adapted to improve existing policies. The complete procurement cycle is covered, from defining procurement personnel roles and responsibilities through to management of awarded contracts. 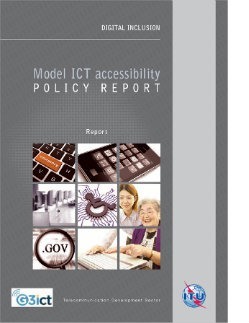 Developed by G3ict and the International Telecommunication Union (ITU) with supporting reviews by accessibility subject matter experts from around the world, this document provides one of the main foundations for adopting public procurement policies. Such accessibility policies are necessary to meet the needs of citizens with disabilities and help signatory countries and their constituent agencies achieve the aims of the CRPD.